The all-volunteer community-based orchestra is devoted to the rehearsal and performance of master works of the symphonic repertoire. Founded in 1964, the Orchestra is currently associated with Merritt College in Oakland, a campus of the Peralta Community College District. 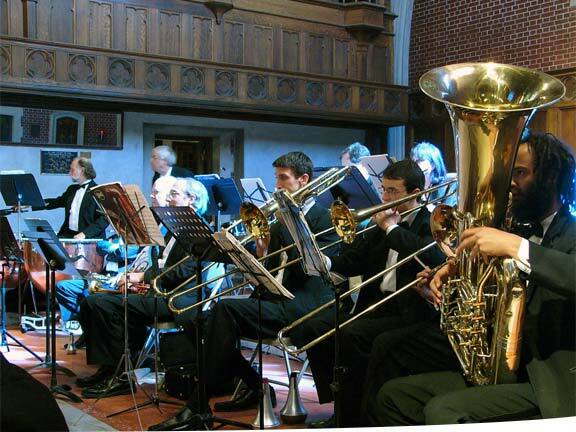 This is our fiftieth season of offering concerts to the Oakland Community. 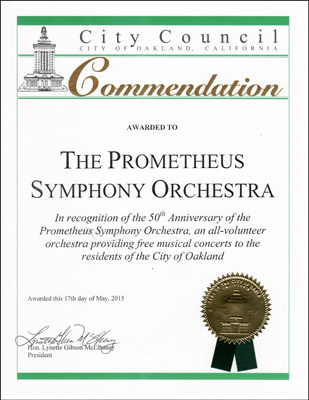 Throughout its history, The Prometheus Symphony Orchestra has performed challenging works from the 20th century (including works of Schoenberg, Berg, Webern, Stravinsky, Bartok, Hindemith, and contemporary composers), as well as the classics of earlier eras. Highlights of recent seasons have included Stravinsky’s Rite of Spring, Mahler’s Fourth, Fifth, and Ninth Symphonies, Strauss’ Death and Transfiguration, and Holst’s The Planets. The Orchestra is supported in part by an ArtsFund grant from the Alameda County Arts Commission, through the generosity of Chevron Corporation and by people like you. Currently the orchestra numbers about 50 members, all volunteers, who pay “dues” each semester, which includes a registration fee to Merritt College. 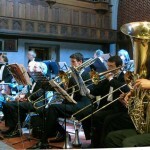 We rehearse weekly and present five free concerts each year.